The TIREX project includes 5 work packages built on an interdisciplinary approach involving geography, geomorphology, spatial analysis and remote sensing techniques, political sciences, information and communication, sociology, scientific mediation, climate modelling and climatology. Work Package 1, dedicated to the reconstruction of Trajectories of Vulnerability, addresses the drivers and mechanisms generating coastal risk and disaster. The main Impacts of tropical cyclones and related physical processes are addressed in Work Package 2, based on numerical modelling, field observations, mapping and statistical analysis. Beach monitoring allows assessing the readjustment of coastal eco-morphological systems in different contexts (from natural to highly-modified by human activities). Work Package 3 consists in analysing Crisis management and territorial reconstruction , based on investigations conducted with local populations and institutions, so as to highlight both the levers and barriers for improved management and reconstruction. 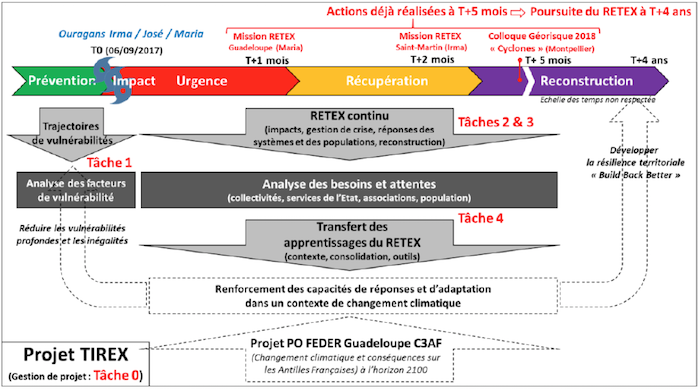 It more specifically focuses on individual and collective responses to the cyclone-induced crisis, so as to assess the resilience of the social and institutional components of affected territories in the short and long terms. 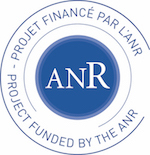 Work Package 4 is more operational, consisting in supporting local to national stakeholders in promoting Improved risk management and reconstruction. It thus a	llows the dissemination of results in study islands. LIENSs is more specifically involved in Work Packages 1, 2 and 4. LIENSs’ researchers work on Saint-Martin, Saint-Barthélemy, the British Virgin Islands (Tortola, Anegada) and Anguilla. Figure 1. 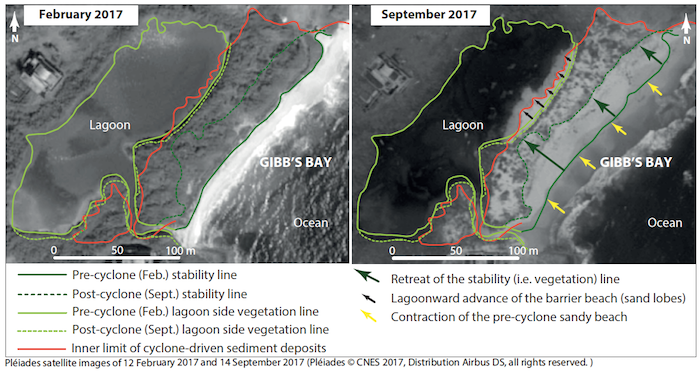 Impacts of September 2017 tropical cyclones on Saint-Martin Island beaches. These cyclones caused a marked retreat of the stability line (vegetation line or outer limit of human constructions, depending on the setting), especially on the highly exposed north-eastern coast of the island. However, the cyclonic waves caused important sediment deposition both on some beaches and inland. On the north-eastern coast of the island, some beaches underwent a 1.60 m upward growth in places. Figure 2. Impacts of September 2017 tropical cyclones on the barrier beach system of Gibb’s Bay. The cyclonic waves eroded and flooded this barrier beach, transferring important sediment volumes from the barrier beach to the lagoon. As a result, this barrier beach migrated landward. Duvat V., Pillet V., Volto N., Krien Y., Cécé R., Bernard D., 2019. High human influence on beach response to tropical cyclones in small islands: Saint-Martin Island, Lesser Antilles. Geomorphology 325: 70-91. Pillet V., Duvat V., Krien Y., Cécé R., submitted. 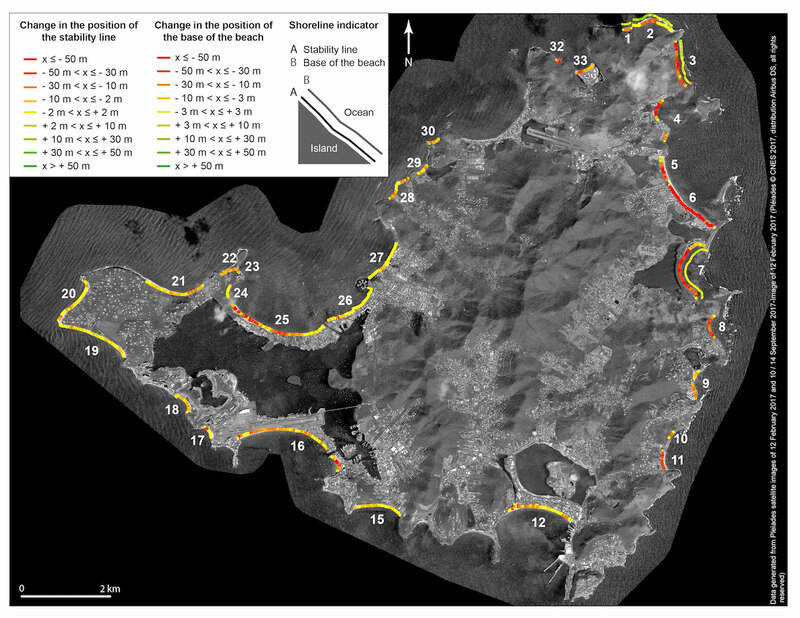 Contribution of human disturbances to the variability of the impacts of tropical cyclones Irma, José and Maria (September 2017) on St. Bartholomew beaches. Ocean & Coastal Management. Pillet V., Duvat V.K.E., Post-cyclone readjustment of beaches on Saint-Barthélemy Island (Lesser Antilles). Littoral 2018, Octobre 2018, Leeuwareden, Netherlands.